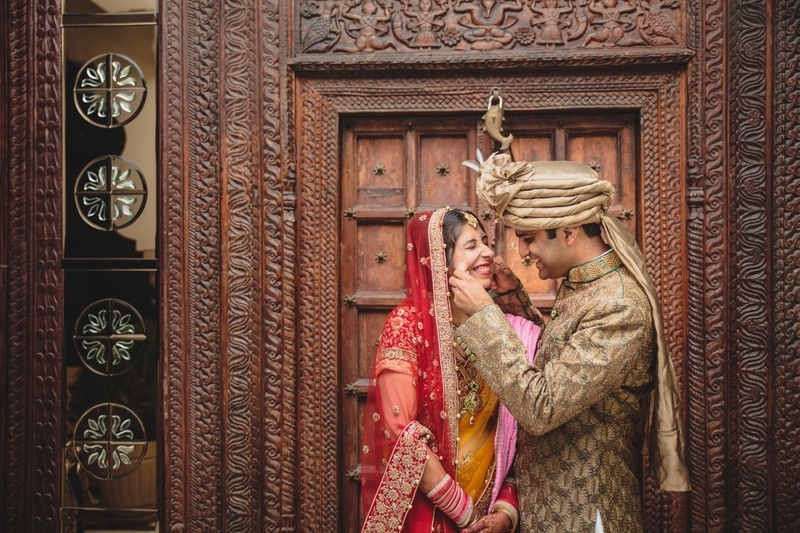 Nimisha and Hemant’s temple wedding took place at Karneshwar Mandir, Karnal in the most traditionally beautiful way possible. If you’re a no-fuss, classic bride-to-be, then this wedding should give you all the inspiration that you need. What we loved about this wedding is the quintessential simplicity with which it was conducted, giving us a new take on sticking to culture and tradition. Plus, some of the beautiful candid moments that the team at Photozaapki captured effortlessly are certainly worth looking at. Happy hands, happy smiles and happy people. This Mehndi function at Noor Mahal, Karnal was indeed a start of all things happy. Nimisha and Hemant set a bright example of comfortably chic with their perfectly mix-matched mehndi day outfits. What better choice than donning the colour of happiness - yellow, to bring out all the joy that the day had in store! The Sangeet night took place in all the cheeriness and merriment that you’d expect from a young, soon-to-be-married couple. The place was done up in some lovely Gujrati décor and bandhani prints, while performers also donned red and white Garba outfits as they serenaded the event. Quirky props were also used to add some contemporary fun. Nimisha opted to wear a midnight blue and beige set with gold-embroidered mirror work while our handsome groom sported a matching three-piece suit and tie. For the second time, our couple decided to colour co-ordinate and looked perfect together as Photozaapki caught some cute candid moments! The Haldi and Kaleere ceremony that was on the morning of the wedding day had everyone upbeat and energetic even after a long Sangeet night. The function that took place at Noor Mahal, Karnal had a bright, cheerful vibe to it and the happy couple only added to all of those joyful spirits. Yet again, our bride showed us how to pull off comfort with style as she graced the event in a pink kurta-set and a statement dupatta with a gold border that matched her kaleere just right. Nimisha had always envisioned her wedding as a simple, intimate affair at a temple with calm and peaceful vibes. And this day wedding at Karneshwar Mandir, Karnal certainly lived up to her dream. As she got dressed for the wedding, which was after the Haldi ceremony, her bridesmaids paid her a visit, staying right by her side and honestly, we’re a little confused as to who was happier – the bride or her bridesmaids! The wedding approached and Nimisha stunned us all in red and yellow saree-lehenga with heavy Zardozi embroidery, choosing to accessorize with minimal yet gorgeous jewellery. Hemant himself was indeed a statement groom in his bronze sherwani and white dhoti. What’s more is the classic yellow and orange decor against the quaint white temple setting made the whole day a perfect combination of highs and calms. With all the love-filled, heart-felt moments, the vidaayi was indeed a moment that made hearts melt. A day encompassing some serenely beautiful and quaint notes, it made us think of all the simple joys of the world, just like the sweet cheek pulls and pecks that we witnessed in the couple’s adorable post-wedding pictures.